It's been a while since I did any of 23 things and although I followed my notes - nothing seemed to happen. I got the screen print on to here, but I shall have to try AGAIN sometime to make sure I can see how it works . The things that one can pick up from the computer are remarkable. It just needs the know-how and the time. I'm sure there's millions of things that I could be interested in, but there are other things that need to be done rather than sitting at the computer "playing"! These are remarkable. Being able to zoom in and presumably download pictures that people have put onto the programme since these had the names of the photogtaphers attached. It will take me I hour 49 minutes to walk that distance. A few years ago when the snow came down and the traffic stood still. I walked and sometimes slithered. Leaving the hospital at about 8 p.m. I got home just after 10 p.m.
That's more like it. It's better than uploading "Hoarder1" to "Hoarder1", but at least it showed the first stage of the operation. It's really a bit silly to upload this to my blog since it is uploading it to itself. Perhaps I'll try uploading 23 things. It is interesting how you can find different articles. However, an awful lot of time is wasted while you're browsing. I can't get away from the feeling that I am wasting time which is valuable. However, I suppose that each time I add a "print screen" - I am knocking the method of doing it into my non-computer mind! We have just had an exhibition at Emmanuel Church, Cambridge on the Universe. We went to the Observatory on Madingley Road, Cambridge and had a very interesting talk. I have been cutting out articles from newspapers and magazines for some years and have put them together into a display file which was on show at the exhibition. which I will add to the appropriate section. I tried to open the file that was on NHS.My library and it said that the page was unavailable and suggested a replacement. My Favourites are more organised now. I've tried to copy most of them (not my personal ones! ), but they're not very well arranged on the page. I tried left, centre and right - but it didn't work out. Anyway - they're there. At least I think I've got the hang of doing a screen print and saving it to my documents and then uploading it. It would have been easier if I could have done a complete list at one time rather than having to keep moving down the list and doing small sections. 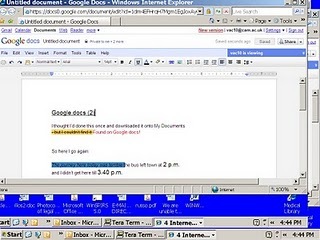 I found Google.docs difficult to download onto My Documents. I shared the first one that I did with a colleague - but she couldn't open it. When I tried to upload it again, it said that it was in a format that it didn't know- so I got rid of it!